This time of year, the school bells ring again for so many of us and our children. A house on a quilt is a symbol of our community and our lives together in society. 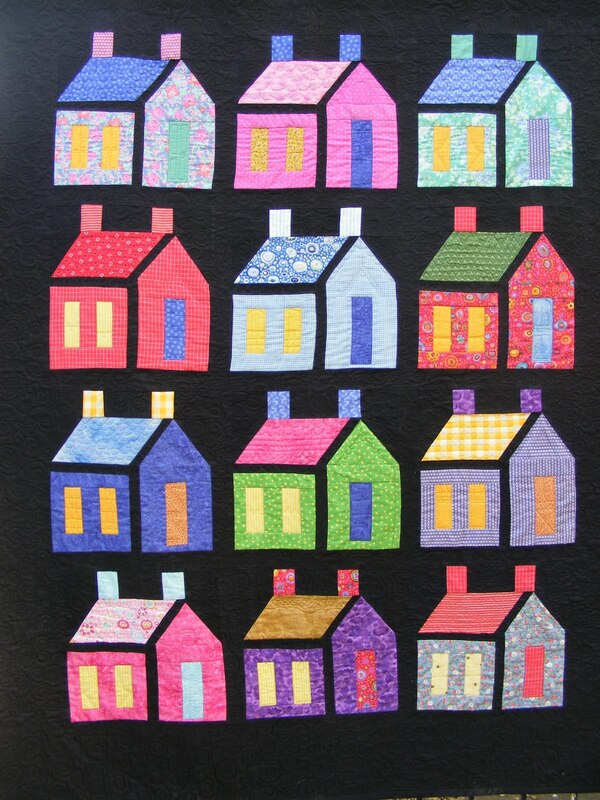 It's no wonder that house quilts remind us of comfort and the togetherness of family, friends, and neighbors. They really appeal to us, maybe because "home is where the heart is." Here's a delightful neighborhood of cheerful houses done in russet and gold. 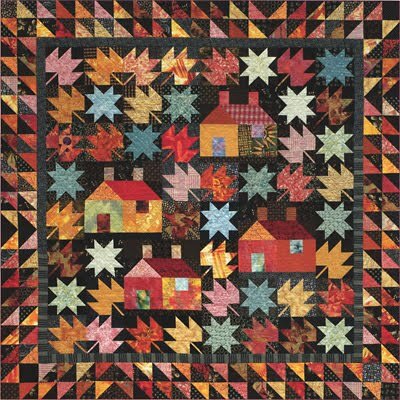 Internationally-famous designer Alex Anderson has brightened the traditional fall quilt by adding contemporary colors of aqua blue and rose pink, which make the maple leaves and houses sparkle against the dark background. Ruth writes, "Much of my work is inspired by nature; my daily walks fill my senses with color and design possibilities." 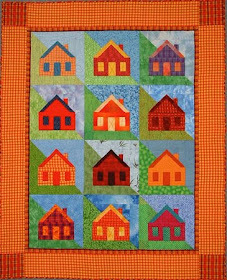 Ruth has done an excellent job of selecting different blues and greens for the sky and earth, which complement the bright orange and orange-red of the homes. 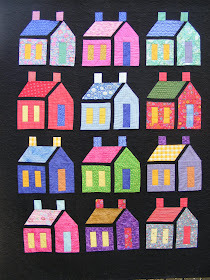 Ruth notes that this is a great pattern for using up fat quarters and scraps. The traditional schoolhouse of the frontier, complete with a bell tower, beckons us back to learning, as leaves swirl in the early autumn breeze. 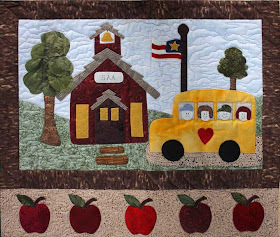 Ruth Powers offers this charming scene as a pattern, along with many other creative designs. 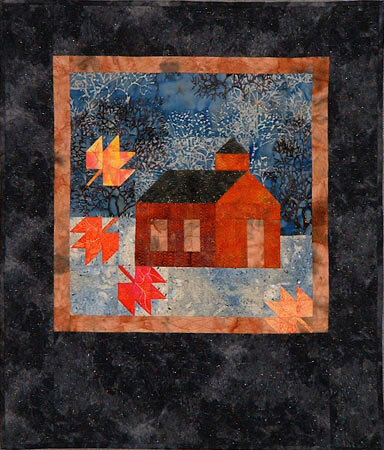 Martha Milne constructed this beautiful Amish-style schoolhouse quilt out of jewel-tone remnants. 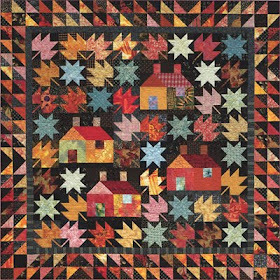 The light and bright windows in this quilt give the inviting illusion of a warm, glowing hearth within, which beckons us inside. A free pattern can be downloaded at Popular Patchwork and Quilting. Martha is renowned for her machine quilting; for her DVDs and tutorials, please visit the machinequilter website. 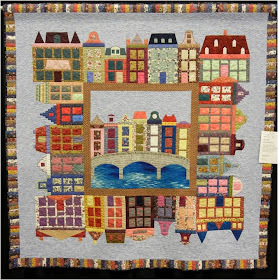 Marilyn Wood notes, "This pattern is from the [ North Sea Quilters of ] the Netherlands. 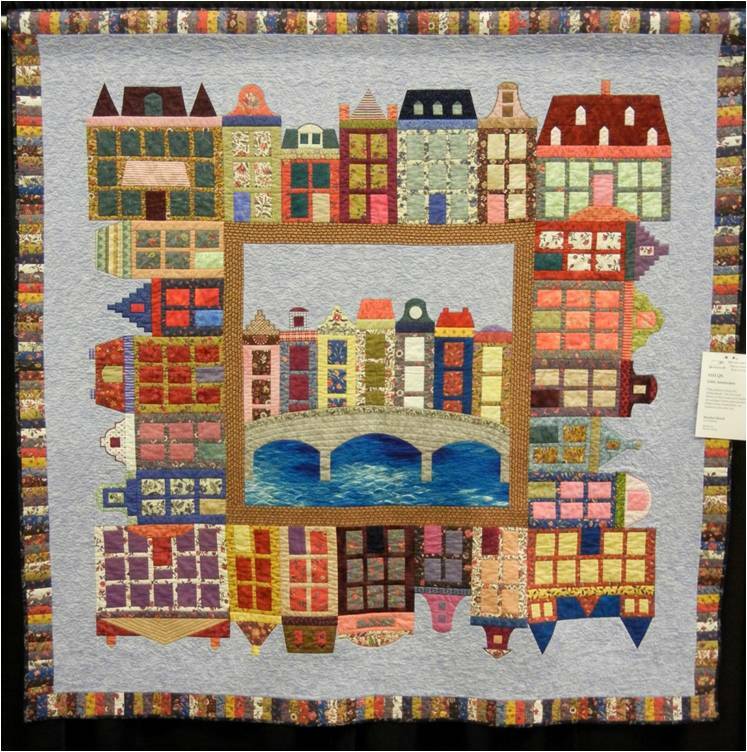 The flowered fabrics in the houses and border are antique Dutch reproduction fabrics from Amsterdam, my husband's favorite city." Marilyn's striped border adds to the lively, upbeat personality of this quilt, which was shown at the 2013 Arizona Quilters' Guild show. 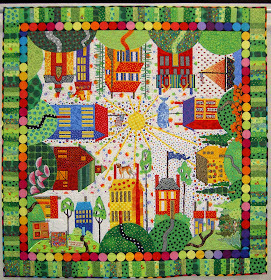 Pat Dicker used high-energy colors to create a lively town adapted from Sue Garman's block-of-the-month quilt, All Around the Town. 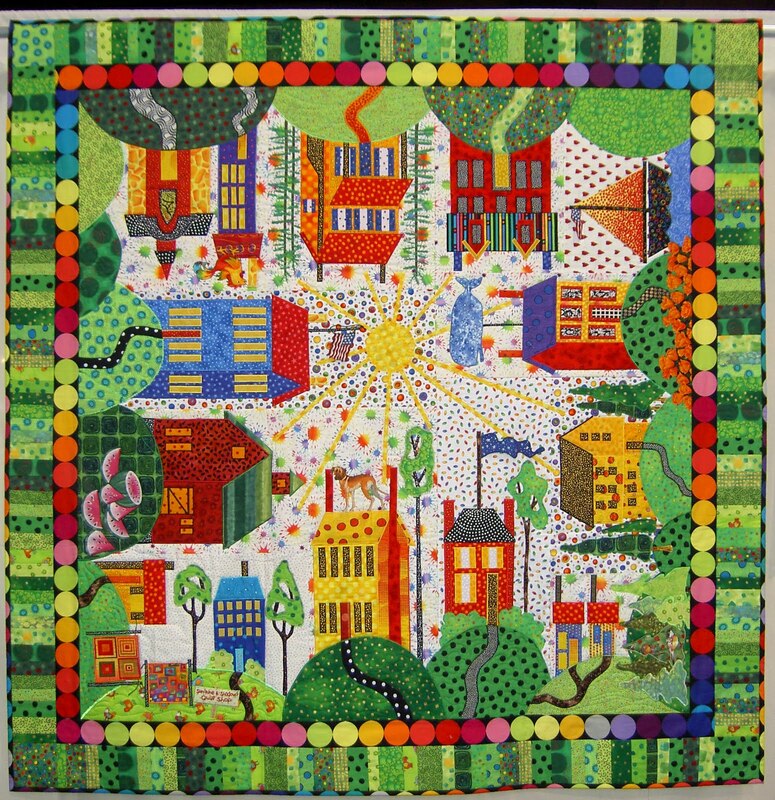 Pat tells us, "I named the quilt 'Pedestrian Friendly' because the original design has cars on it, and I chose to leave them out, so that the 'residents' would just walk from house to house." 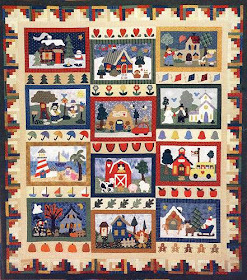 Quilter and teacher Sonya Chinn, creator of the Sonya's Snippets blog, sewed this charming scene for a block-of-the-month quilt which she calls 'There's No Place Like Home'. 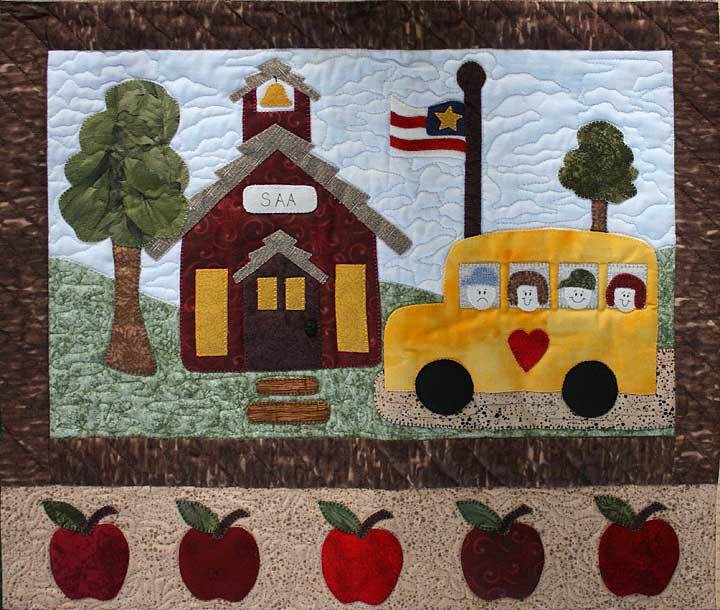 Sonya has added an individualized touch by placing the initials of her children's school on the quaint schoolhouse. 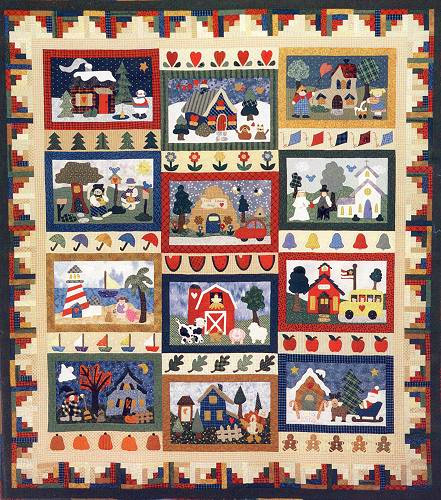 Sonya's complete quilt was based on the "Home Is Where the Heart Is" pattern, shown below, by The Stitch Connection. Image credits: Little Amsterdam was photographed by Quilt Inspiration. The quilts by Pat Dicker, Sonya Chinn, Ruth Powers, Alex Anderson and Martha Milne are shown with permission of the artists and were originally featured in 2010 at Quilt Inspiration. Love the round and round houses...looking forward to the bell not ringing for me in 4th term as I'm taking som long service leave.